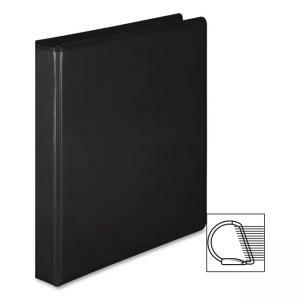 Premium view binder delivers ultimate performance with an extra-durable hinge and custom-formulated, PVC-free polypropylene cover that makes them nearly impossible to rip. Material lasts 10 times longer than vinyl and is better for the environment. D-Lock never-gap rings provide increased sheet capacity and spill-free security for your papers. Plus, for extreme ease of use, single-touch triggers allow you to open all three binder rings with just one finger. Crystal-clear view covers and spine allow quick and easy binder customization. In addition to top-notch durability, the binder also offers extra storage with four pockets. Product Name: Ultra Duty D-Ring View Binder with Extra Durable Hinge, 1"